City Councilman Brad Lander has put together a meeting at P.S. 58, at Carroll between Court and Smith streets, on Thursday night, April 14, to discuss NYC’s new green infrastructure plan, how it will work and also to discuss grants available for individual property owners, businesses and non-profits who want to create green roofs, plant pollution-catching trees and rain gardens, use rain barrels, or otherwise participate in environmentally-favorable property improvements. NYC Department of Environmental Protection Commissioner Caswell Holloway and DEP staff will attend the meeting to talk about the plan, what it means for the Gowanus area and how residents can get involved. The Gowanus Canal is the primary drainage basin for the South Brooklyn area, for better and for worse. “While the plan won’t solve all of our water quality problems, I believe it is an important step in the right direction, and I hope our community will be the most active of any in the NYC in taking action,” Lander said. The city’s goal is to capture an inch of rainfall and prevent it from becoming runoff. If successful, preventing an inch of rain from gathering pollutants and running into area waterways will reduce water runoff pollution by 10 percent over 20 years, according to Mayor Bloomberg’s NYC Green Infrastructure Plan. The main issue here is that New York City is an old city with an old sewer system. When it rains, rainwater washes over paved and hard surfaces, collecting pollutants, and floods the sewer system, sending what’s called “combined sewer overflow,” (a very nasty mix of rain and raw sewage from the sewage system, in addition to pollutants picked up from the street and factories and etc.) into local waterways. The combined sewage overflow is a major issue in regards to the Gowanus Canal, which floods with the toxic runoff after heavy rains. 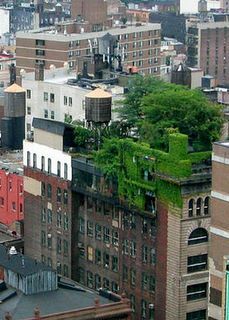 The NYC Department of Environmental Protection (DEP) recently released a “green infrastructure” plan to help clean up NYC’s waterways. When: April 14th, 7 p.m. – 9 p.m.